Despite being a (slightly) Quantified Athlete who maps and logs my runs, I’ve never paid much attention to the Quantified Self movement and measured my life by logging any other aspect of my life. Viewed positively, the insight from visualising our data promises to help me form good habits, meet life goals and make me happier and/or healthier. More darkly, I fear the connotations with surveillance, normativity and conformance, the industrialisation of everyday life that makes every action subservient to the demands of productivity this kind of self-tracking work might imply and a reluctance to fully include women. Part of me is also curious about the implications are for humanity when we align our bodies so closely with devices that augment it, and potentially allow us to hack it, and when we combine our analogue feelings with digital measurement. I wonder is self-tracking an empowering or an oppressive phenomenon? One way to think about these issues is not just to read about them but experience it and try an activity tracker myself. Whilst researching sport informatics and analytics and training for a half marathon (whilst being in full control of my schedule and eating habits) seemed like a good time to try it. First problem was deciding what tracker to use. There are an increasing number of the market all doing pretty much the same thing but with slightly different specifications and form factors and backed by a variety of applications and online dashboards. In fact the choice was quite overwhelming. Whilst there are plenty of reviews around, the selection will also be deeply, personal and involve deciding what will work best for you. It’s no easy task to figure this out from other people’s impressions and opinions. 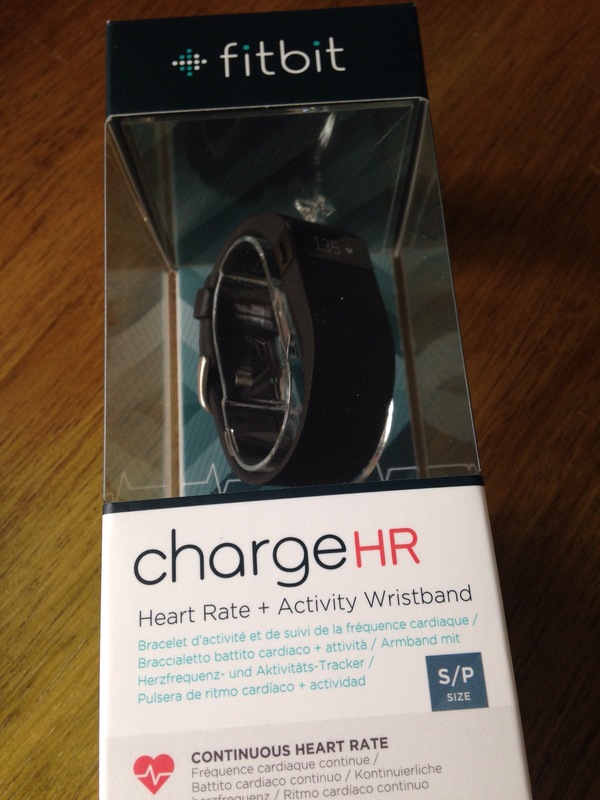 Eventually, after visiting several websites to read product information, reading several reviews, checking prices and ratings in a number of online shops, and signing up to take a look at several of the apps and dashboards, (many of which allow you to use them to log basic metrics manually without needing an associated device), I decided to order a FitBit Charge HR. One of the things that I love about running is being able to switch off and so I am a bit apprehensive that wearing a tracking device will be a distraction during my workouts. I don’t run with a watch, just with a phone application in my back pocket giving quiet updates and cues every so often. The FitBit Charge HR collects a lot of data but wears its power lightly, offering a subtle, configurable OLED display. I hope I’ll be able to configure the device so it stays discreet and silent even during vigorous activity. HR measurement at the wrist is a growing development that will allow me to track a piece of data I haven’t previously because I don’t like wearing a chest strap, even though these are still slightly more accurate. It also looked like it has a small design, which would suit my female sized wrists better than some of the bulky smart watch designs, and a secure strap like a watch, rather than a clip. From this I realised the form factor was more important to be than the functionality, accuracy or analytical features. Decision made I listened to Inquiring Minds podcast #91 that interviewed Rachel Kalmar, a neuroscientist and data scientist, on the power of wearable technology. There were some interesting things in this interview that informed my perspective on what trackers do, and can do and how to set my expectations accordingly. Firstly, accuracy is relative. Whilst they are continually improving, trackers can’t measure us with absolute accuracy and certainly not in a way that is directly comparable with other people or other trackers. As Rachel explained, what is important is that they are “internally consistent”. Once they have established benchmark metrics for an individual they should continue to measure those metrics in the same way so that individual can tell how their behaviour differs from previously and whether it is trending in the right direction. We shouldn’t expect them to be clinical grade or be able to replicate a sport science lab in terms of absolute precision … yet. Secondly, a ‘step’ is used quite generically as a unit of activity. A modern activity tracker may have taken its terminology from pedometers and may mostly track contact with the ground, but is now also about broader measurement of everyday movement. In the interview Rachel poses the question What does a step mean when you are doing yoga? The continued use of step is perhaps slightly misleading if now trackers aim to combine the continuous stream of data from all the sensors packed into the device with software algorithms to calculate how many motion units an individual accumulates in a day more broadly. Crazy upper body kitchen dancing counts, albeit in a different way than walking. The combination of sensor position, software and person create huge amounts of variability in ‘step’ count and the device will need to be calibrated and the your goals configured accordingly once some initial data from your typical usage is available . Definitely an interesting listen with some useful input on expectation setting when approaching activity tracking. This is where my experiment might fall down. I don’t really have any interesting questions, or even any specific goals (beyond say the general and ongoing fight against the entropic forces of middle age) and I am therefore a bit uncertain what activity tracking data will tell me or really help me achieve. I feel like I already know what is ‘good’ and ‘bad’ about my behaviour and yet I keep eating croissants. Perhaps the data will confirm or deny my suspicions. So I’m not expecting more data to be more informative and I doubt the extent it will influence my behaviour. I wouldn’t say I’m excited, but I am intrigued about the experience. A reminder my survey on athlete information and data use is now open. If you are an amateur runner, cyclist, triathlete, swimmer or rower please take the survey and let me know how using information resources or getting insight from your training data helps you in your sporting goals.